With a leadership shakeup at the nation's No. 2 health insurer, and speculation that another payer is setting the stage for a second billion-dollar merger attempt, the insurance industry is bracing for major changes. Anthem's decision to swap its CEO Joseph Swedish, who is retiring, with UnitedHealth Group veteran Gail Boudreaux sparked speculation in the industry that Anthem is positioning to remake itself to resemble UnitedHealth Group's integrated insurer/pharmacy benefit manager model. Bolstering that speculation is Anthem's recently announced plan to launch its own PBM, IngenioRx. Anthem's decision to hire a former UnitedHealthcare CEO and Humana's sale of its long-term care insurance business has the industry bracing for major changes. The Indianapolis-based insurer's move to be more like UnitedHealth is only natural: "The entire industry has United-envy," said Gary Taylor, insurance analyst with J.P. Morgan, pointing out that CVS Health's rumored takeover of Aetna is driven by the same desire. With her background as head of UnitedHealth's insurance arm and time spent cutting her teeth at not-for-profit Blues-affiliate Health Care Service Corp., Boudreaux could just be the leader Anthem needs to put itself on equal footing with No. 1 UnitedHealth. She's "a total pro," said John Gorman, a former federal health official who is now a consultant for Medicare Advantage plans. "She knows Anthem's nemesis, UnitedHealth, from her days inside. She knows government programs intimately, which keeps the lights on for Anthem." Indianapolis-based Anthem has long trailed the financial success of its biggest competitor, Minnetonka, Minn.-based UnitedHealth. With annual revenue of $84.9 billion, Anthem's top line is second only to UnitedHealth, which brings in more than double the revenue at $184.8 billion annually. That's despite the general belief that Swedish, 66, has had a successful run as CEO of Anthem. Swedish, who declined comment through a spokesperson, took a troubled health insurance company with stagnant growth and turned it around during his nearly five years at the helm, equity analysts agreed. His predecessor, Angela Braly, resigned in mid-2012 amid mounting criticism from shareholders who were unhappy about the payer's financial performance. During her tenure, which began in 2007, Anthem's share price fell 42% to $57 at the time she stepped down. While Swedish has been CEO, Anthem's share price has soared along with most of the major publicly traded health insurers, rising 230% to $212. Ana Gupte, industry analyst at Leerink Partners, credited Swedish with lining up a stellar leadership team, improving Anthem's Medicare star ratings, and successfully integrating the payer's 2012 acquisition of Medicaid provider Amerigroup, which nearly doubled Anthem's Medicaid business. While he eventually followed in UnitedHealth's footsteps and ordered a retreat from the Affordable Care Act exchanges, Swedish also set up Anthem to grow in the lucrative Medicare Advantage market, most recently striking deals to acquire two Florida-based Advantage plans, HealthSun and America's 1st Choice. 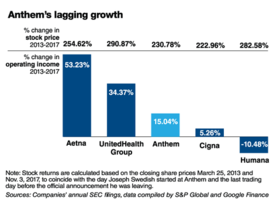 But Anthem's stock returns have lagged behind other for-profit national payers, including Aetna, UnitedHealth and Humana. Its bottom line has slightly decreased from $2.49 billion in 2013 to $2.47 billion in 2016. 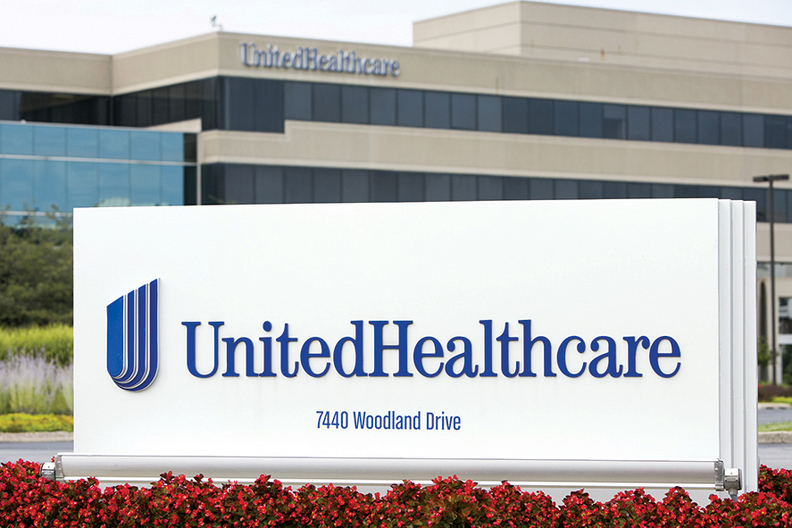 In contrast, UnitedHealth's profit grew 25% to $7.1 billion in 2016 from $5.7 billion in 2013, thanks to its combo of insurance, OptumRx PBM and consulting. While Anthem's failure to acquire Cigna Corp. in a $54 billion deal will remain a blotch on Swedish's record, the company is still enormously profitable on its own. And if Swedish put the ball in motion to grow Anthem and its services, then Boudreaux is poised to knock it out of the park. UnitedHealth and Anthem "were not competing on the same level," said Hema Singh, analyst with S&P Global. But with Boudreaux's experience at UnitedHealthcare—she served as CEO of the health insurance unit from 2011 to 2014 and was with the company beginning in 2008—she'll be able to build out Anthem's PBM much like UnitedHealth built out Optum, though it will take time, Singh said. "They're on the right path here." Meanwhile, Humana last week said it is paying a Texas-based insurance company millions of dollars to take its long-term care business off its hands. It's also laying off or buying out 2,700 staff members, or 6% of its workers companywide, making analysts wonder if the insurer could be gearing up for another megamerger deal after its failed attempt to merge with Aetna. The Louisville, Ky.-based insurer said Monday evening that it has agreed to sell the stock of its long-term care insurance unit to Continental General Insurance Co. for $10,000. Humana will make a $203 million cash investment into its long-term care business and also transfer about $150 million of statutory capital with the sale. Humana will take a pre-tax loss of $900 million from the sale, expected to close in the third quarter of 2018. Gupte said the sale could mean Humana is "trimming the fat" in preparation for a bigger deal potentially with Cigna or Express Scripts. She pointed out that Aetna in October announced the sale of its group life and disability insurance and absence management businesses to property-casualty insurer the Hartford, just days before reports emerged that Aetna struck a merger deal with CVS Health. The companies haven't yet confirmed the existence of a deal.